Shrimp Jambalaya could be a second cousin of gumbo – the recipes are similar with the exception of cooked rice. In gumbo, the rice is cooked separately and the gumbo ingredients are ladled over the rice. In jambalaya, the rice is slowly cooked in the same pot with the rest of the ingredients. Jambalaya is a rice dish that is highly seasoned and strongly flavored with combinations of beef, pork, poultry, smoked sausage, ham or tasso (lean chunk of highly seasoned ham), or seafood. It is a very adaptable dish often made from leftovers and ingredients on hand, and thus traditionally a meal for the Cajun rural folks rather than their wealthier town cousins, the Creoles. It is thought that the word “jambalaya” comes from the French word “jambon” mean “ham,” the French words “a la,” meaning “with” or “in the manner of,” and the African word “ya,” meaning “rice.” Put the words together and they mean “ham with rice.” The dish is a takeoff from the Spanish paella and is also amazingly similar to the West African dish called jollof rice. Jambalaya is a one-pot dish – most cooks prefer to cook it in cast-iron pots. There is one rule in cooking jambalaya. After the rice has been added, jambalaya should never be stirred. Instead, it should be turned, as this prevents the grains of rice from breaking up. Most cooks turn jambalaya only two or three times after the rice is added, being sure to scoop from the bottom of the pot to mix rice evenly with other ingredients. Shovels are used when cooking outdoors in large cast-iron kettles. Jambalaya is a favorite at church fairs, political rallies, weddings, family reunions, and any other affair with an excuse to serve food. 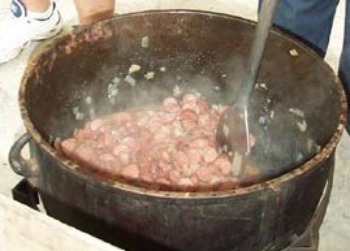 In Gonzales, Louisiana, the Jambalaya Festival and World champion Jambalaya cooking Contest is held annually. This event attract participants who have spent years perfecting the art of cooking and seasoning this wonderful stew. More delicious Louisiana dishes to help celebrate Mardi Gras. * Can substitute your favorite hot sauce. ** To easily prepare the tomatoes, use a sharp knife and cut the tomatoes while still in the can. *** To add flavor, place the shells of the shrimp in a saucepan and cover with water. Simmer over low heat approximately 7 to 10 minutes. remove from heat and strain the broth; discarding shells. Substitute shrimp broth for the water in the recipe. In a large heavy pot over medium heat (I like to use my Cast-Iron Dutch Oven), fry the bacon until it begins to turn brown. Add onion, garlic, celery, and bell pepper; saute 8 to 10 minutes or until vegetable are soft. Stir in thyme, salt, Tabasco Sauce, cayenne pepper, cloves, bay leaf, and tomatoes. Stir in clam juice and water; bring mixture to a boil. Add rice, cover, and turn heat to low; cook 30 minutes or until the rice has absorbed almost all of the liquid and is cooked through. Gently stir the jambalaya, then add shrimp and parsley, tossing lightly to distribute them evenly. Cook 6 to 7 minutes until shrimp is opaque in center (cut to test). Remove from heat and serve immediately. Hi! Can the tomatoes be replaced? Cooking for a friend who cannot eat them :(. Thanks!